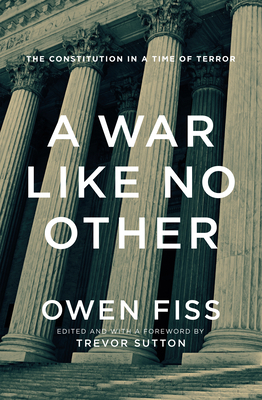 Owen Fiss has been a leading legal scholar for over thirty years, yet before 2001 it would have seemed unlikely for him to write about national security and the laws of war; his focus was civil procedure and equal protection, but when the War on Terror began to shroud legal proceedings in secrecy, he realized that the bulwarks of procedure that shield the individual from the awesome power of the state were dissolving, perhaps irreparably, and that it was time for him to speak up. The ten chapters in this volume cover the major legal battlefronts of the War on Terror from Guantanamo to drones, with a focus on the constitutional implications of those new tools. The underlying theme is Fiss's concern for the offense done to the U.S. Constitution by the administrative and legislative branches of government in the name of public safety and the refusal of the judiciary to hold the government accountable. A War Like No Other will be an essential intellectual foundation for all concerned about constitutional rights and the law in a new age.